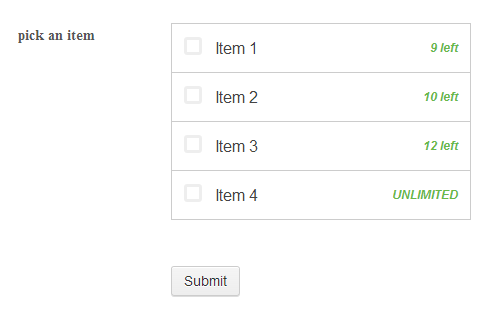 i compile the form and check the item1 (with 10 left ) but when i refresh the page for compile again the form (like another user) i found again the item1 with 10 left . 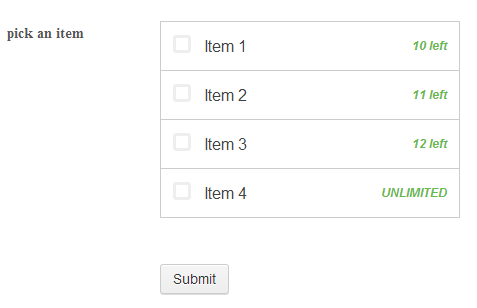 You seem to be having an issue with getting the gift registry widget inventory to update properly. I did a test of it on my end and it's working. If you're using just the default settings then you will need to change out the API with your own Account's API found here. If you don't have one then go ahead and create one. It works best with full access. Once you have that switched out the **encoded** in the gift registry widget's api setting with your own it will update it and it should then automatically show the updated count right away.